Here we are at the fun stage of weeks 4 and 5 (week 3 is reprinted for comparison); now in addition to eating and sleeping, we have some playtime to add. 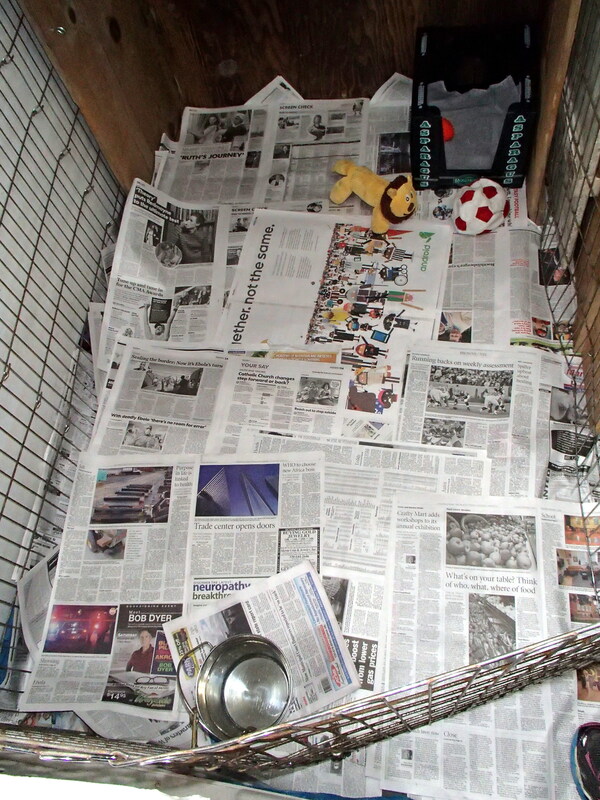 The team has graduated from the litter nursery box to a grand enclosure fully newspapered and furnished. Now we have to use two pans to provide everyone a place at the table! So what comes next? Later today, we will be bathing all twelve AGAIN–they seem to think that food works by osmosis through the skin instead of orally….<geesh!> Then we will be taking individual photos to show the gleam in their eye. 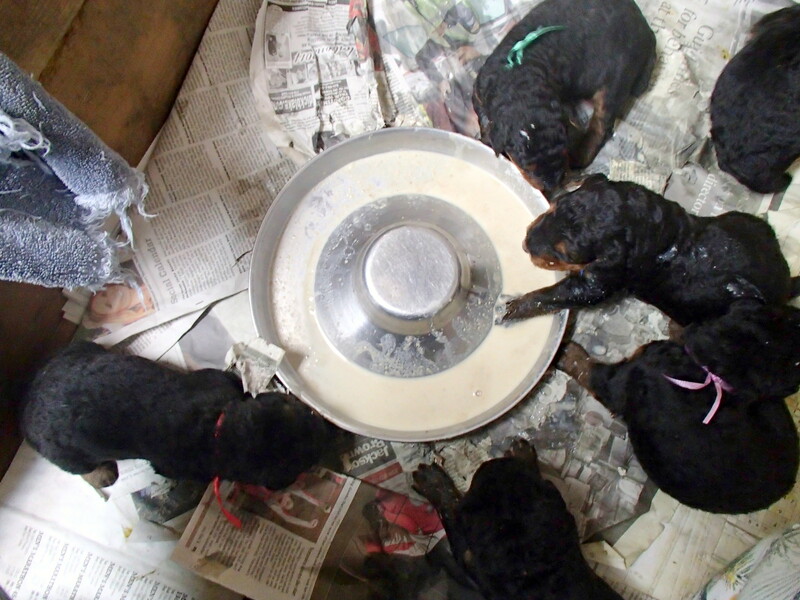 We are sure that you are tired of looking at puppies eating! But here it is again anyway as they enjoy their double dish all you can eat buffet! So, the recap to our litter born from “Harry” aka Am & Can Ch Terrydale HK Traymar’s National Affair and from “Verity” aka Seneca Ariana Verity, born on October 30th. Their eighth week falls on Christmas time, so consider your holiday plans and think about the arrival of a new family member after the holidays! Seneca Airedales are located at 1814 North Revere Rd, Akron, OH 44333. For more information, please direct your inquiries to our email: aireseneca@gmail.com or by phone: 330-666-2004 We have also listed this litter on our Breeder of Merit page on AKC Marketplace. The Terrier Trio is fat and sassy! With just three to raise up, Vega is having a great time with them now that they are showing personality and real character. With long ribbons dangling, PINK peers out, perhaps planning to ambush one of her littermates. With one paw raised, GREEN is picture perfect but I’m sure, planning her next bit of deviltry….Guarding his fort in a well defended position, BLUE BOY is contemplating his next move. Actually, more of our photos looked like this….and this….as we tried to get them to hold still long enough to take a sweet photo. They are much more in motion as you can see! On the left, pink and blue, and on the right, blue and green. After all, it’s much, much more fun to play with the leaves than take a photo! As a recap, the Terrier Trio are now 5 weeks old and can travel to their new homes the weekend of Thanksgiving or thereafter at 8 weeks. They were born September 26th to Canadian CH Seneca Brave to the Max CD “Max” and Vega. The dad is Max–click his name to see his introduction. His sire is Champion D/KfT, Deutscher Champion VDH, Champion INT.FLASH VON ARGONAUT VPG1, VPG2, VPG3, IPO3, AD, FH, Körklasse. 1A, Teilnahme KLSP 97 + 98. The mother, Seneca Vega Harp Star, was born to her parents CH Darbywood’s Baraboo of Singing Hills and Seneca Ready to Appeal, which you can see here: Vega1 , Vega2 , Vega3. Vega was the Pink puppy- yes, we do need to get some grown up photos of Vega. Remember we are celebrating our 12th generation of Seneca Airedales so you can follow the entire line! For our available puppies please drop us a line in the comments box below-More info on request! 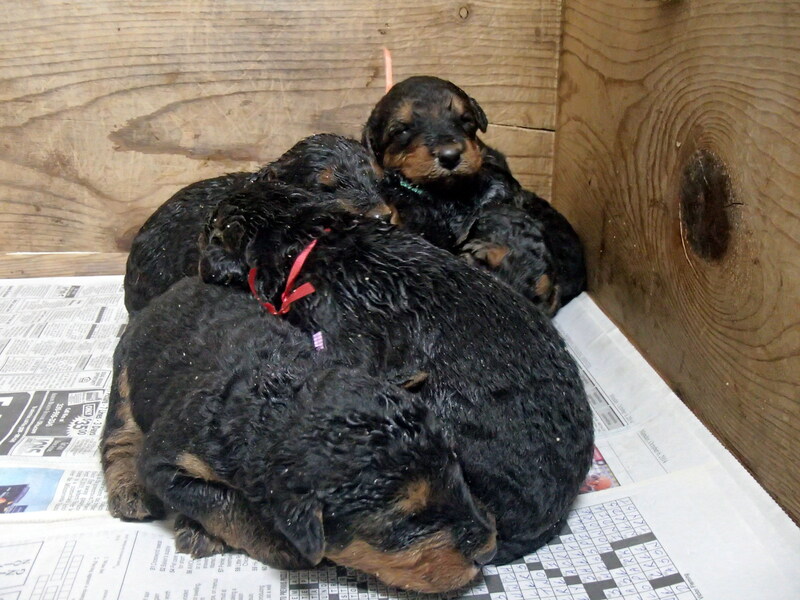 Puppies were born September 26th to Canadian CH Seneca Brave to the Max CD “Max” and Vega. The dad is Max–click his name to see his introduction. His sire is Champion D/KfT, Deutscher Champion VDH, Champion INT.FLASH VON ARGONAUT VPG1, VPG2, VPG3, IPO3, AD, FH, Körklasse. 1A, Teilnahme KLSP 97 + 98. The mother, Seneca Vega Harp Star, was born to her parents CH Darbywood’s Baraboo of Singing Hills and Seneca Ready to Appeal, which you can see here: Vega1 , Vega2 , Vega3. Vega was the Pink puppy- yes, we do need to get some grown up photos of Vega. Remember we are celebrating our 12th generation of Seneca Airedales so you can follow the entire line! Tuesday night, September 25th, I recognized the 1000 Yard Stare that a mother-to-be develops when there are some internal changes going on….I watched closely but was able to get some sleep and, very considerately, Vega didn’t start to get serious until about 10 am on September 26th. As she curled up, I knew the final stages of labor were about to produce a puppy and just 15 minutes later…. All born strong and healthy with Vega for her first time litter proving to be very motherly and caring of her puppies. We had done an ultrasound indicating 2 puppies, so to find we had 3 was both welcome and a surprise! Eight weeks old today! First the boys…. Red – tentatively available, Conformation (slightly long in back but dramatic outline! Appears to be built to really move well), Obedience and companion potential. And now for the girls…. Gold – Now in MI getting ready to hike the Appalachian Trail next year and planning in obedience and some field work with BIRDS! 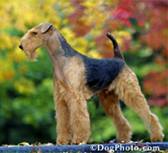 Sky Blue – I seem to have trouble letting go of this one….11th generation of the Seneca Airedales? The Sky is the Limit! Her new slogan! Pink – Also in MI going to work with her professional groomer mom who also has access to puppy socialization classes multiple times a week for her future obedience career….? 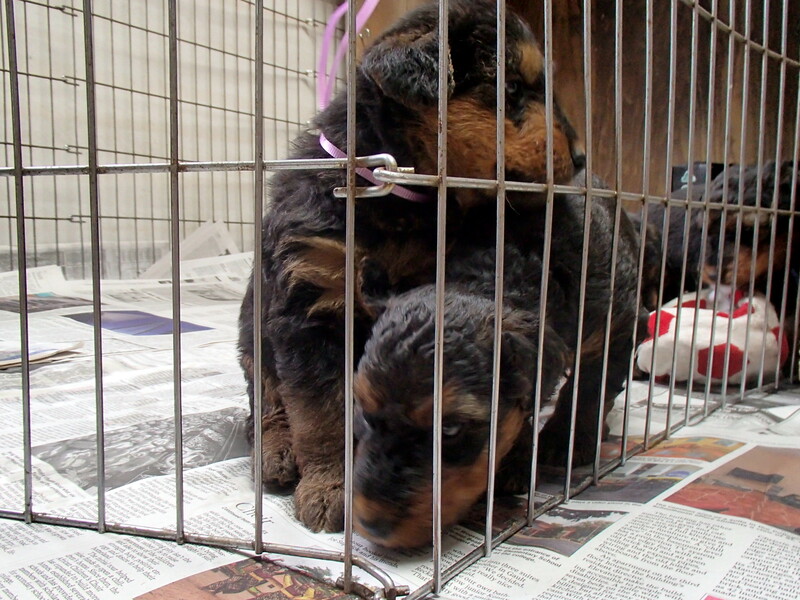 Approaching nine weeks old…..holding them back so that the Merci litter could catch up a bit with them. Pink – Heading up to Oregon to be an AKC obedience, rally, agility, field trial….well, who can tell this puppy what she *can’t* do!?! Now if we could just get some WARM weather so the puppies can be outdoors for any length time….play has become a serious activity for them! For our available puppies please drop us a line in the comments box below-More info on request! Update with pics from April 7–Well, it wasn’t warm but it was clear and sunny. So…..we did try a short time outside. Now keep in mind that these few photos took over 2.5 hours to get. First getting them out, then cleaning the inside play spaces, then photos and getting them all back in the warm again. All the toys were so badly trashed that they are not in the photos because they were soaking to be cleaned! Still, I think that they enjoyed the brisk air for their first time EVER outside! Getting up to seven weeks old now! Six weeks old…..loving the outside play so much that they are all tuckered out! Everybody is getting their first vaccinations and have finished a preventative worming cycle. In just a few more days, April 12 or 13th, we will be doing the PAT, physical evaluations, and photo shots. 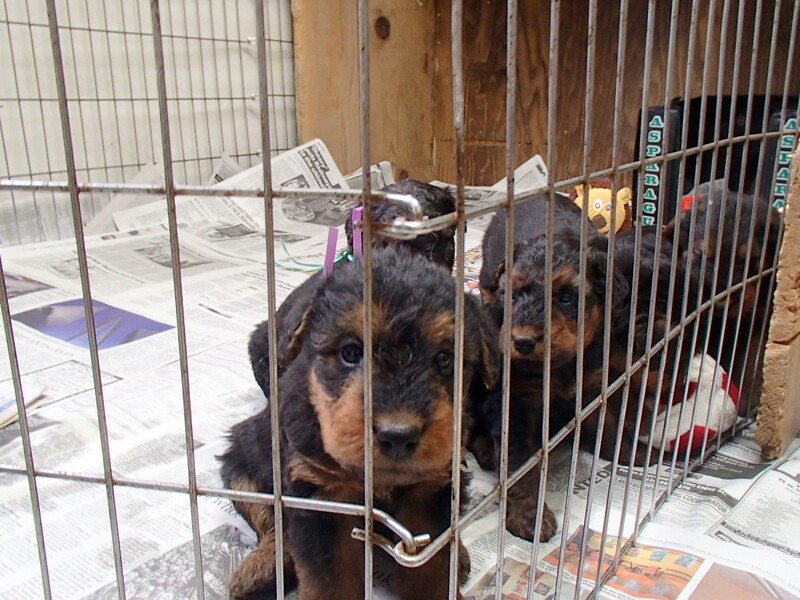 The long awaited report of puppies at Seneca Airedales is finally here! First, expected on Valentine’s Day, but born just one day later on February 15th, we introduce the puppies from Bruno and Verity. Learn more about the parents by clicking on their names….. The sire of this litter, Seneca Handsome King (OFA AT-5684 Good), is himself sired by a German import with obedience/performance titles and we are very excited about him! His mother is our own Fancy and this is the first time Bruno has been the father of a litter. You can read more about Fancy and find a video of Bruno as a year old puppy. We prepared a safe secure place well in advance. Verity had a bath and a trim to get ready too. Seneca Ariana Verity (OFA Excellent) spent her Valentine’s Day preparing a nest for her puppies. We enjoyed providing her with plenty of newspapers for shredding. Then, at 5 am on February 15th, we decided to have puppies! She’s so happy to see the first little guy–look closely, he’s there…. Poor little Red didn’t survive long even with close supervision. I still grieve for him and what might have been. I set a schedule of checking them all day which makes me so glad that I can work from home. During the night, I was checking them at 12 Midnight, 2 am, 4 am, and 7 am. Sleep was a bit of a luxury that I could go short on for their sake. Next, waiting for the big day….then born with just a little excitement as we ran to the well known Animal Clinic Northview, where we had a C-section performed. We introduce the puppies from Euro and Merci. Learn more about the parents by clicking on their names or links….. The sire of this litter, UCD, URO1 Dollar von Erikson PCD, CD, TD, VCD1, NJP, NAP, NFP, JH, SHF, JHR, BH, AD, IPO2, RATO, RL2 , is a German import with obedience/performance titles and OFA AT-5512 Good. He and his owner/trainer Linda Sorak of IL, are perhaps just a bit in the way of overachievers! More training titles are on the way since you just can’t keep a good dog on the couch! If you’d like to do more research, here are some videos of Euro: First in his IPO and IPO Revieren practice, then in AKC Obedience Novice class. We are feeding some solid foods and they are all growing fabulously well. We will be updating. Plans for the Puppy Aptitudes and physical evaluations/photos are scheduled for April 13th. Max’s Puppies Between 5 and 6 Weeks! The father of our puppies born 11/16/2016 is Canadian CH Seneca Brave to the Max! 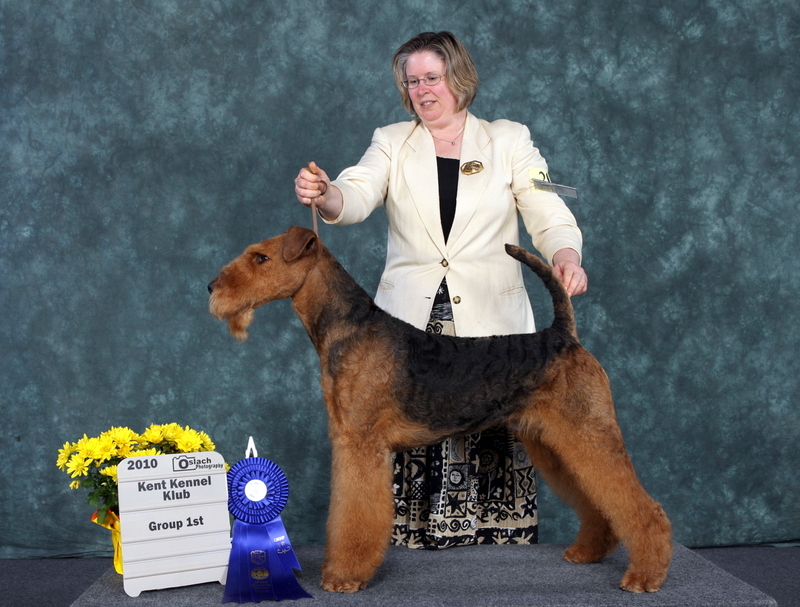 Max excelled at loyal devotion and obedience, evidenced by his High in Trial at the National Specialty, Year of the Airedale 2003. I was very interested in his talents and bloodlines but he wasn’t leaving Germany–and so decided to bring my very own CH Seneca Brave Chance (Jacki) to him. Jacki had recently finished her Championship owner handled with three majors by her breeder–and my son Tim. After some months of planning, flying Jacki to Germany BEFORE she was in her heat cycle and waiting….and waiting….finally, Jacki was bred and sent back to me in the USA. 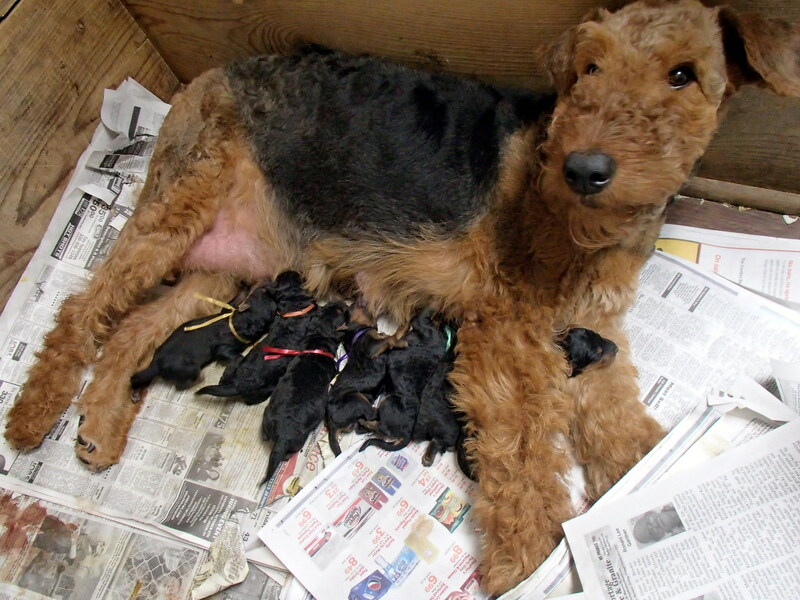 With considerable AKC paperwork, we were able to produce and register a litter of Flash puppies in Ohio! Jacki has a special place in our family as my oldest son Tim took an interest in Junior Showmanship and Jacki was his best friend of all the Airedales we ever had. Tim even won a major towards her Championship under well known handler and AKC judge, Richard Cashoudian–we have a great show pic of that. I really need to look up more photos and scan them in. He took his senior high school photos with her. Shortly before she passed at the age of 13 he put his head together with hers to say good-bye. Now we are playing with Jacki’s grandchildren, Max’s kids, and Allie’s babies–all in one package! The Big Day–when the puppies leave the whelping box and graduate to a play area! This took me over two hours to do, plus new ribbon collars for all! Here is the pristine prepared papered area…. We have a box with a blankie, a squeaky red football, a corduroy lion,and a red/white plushy soccer ball. After some exploration, some experimentation, and some small excitements, the soccer ball was voted most popular–for today! There is a nice clear bucket of water just the right size for puppies that are 4 weeks old and soon to be 5 weeks old. All are eating about 4 times a day at the moment, plus mom’s visits for milk although there just isn’t enough to go around with such BIG babies. Don’t worry, as they demolish pans of food thoroughly! In another week, they will only want three times a day and will be headed for two times a day after that. Bright eyed and increasingly active, the puppies get free range of the whole room when I am changing the papers every morning. Each day, they are finding ever more things to get into! What maternal influence could possibly complement Luckyboy’s lineage and traits? We wove the pedigree with care, going to Am Can CH Seneca Whodunits Motive (OFA Excellent), left, who embodied seven generations of Seneca background and was an Owner Handled Canadian Group winner. Then, with this daughter, we wove back to Germany again with German Import UCI International CH/Am CH Ikarus von Garnsee, right, again an Owner Handled Can Group winner. This felicitous combination brought us into the present with our own Am Champion Seneca You Will Fancy This, OFA Excellent. Now, what everyone has been waiting for…. These two photos taken early on October 23 by a very sleep deprived person! 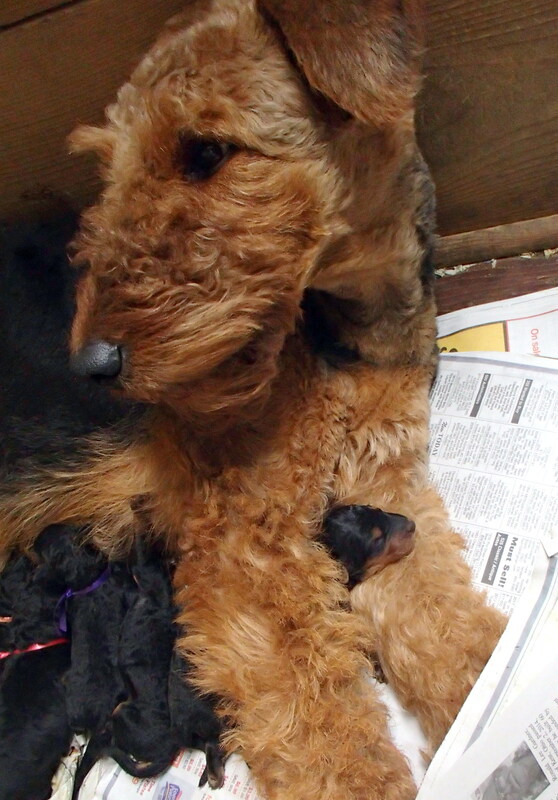 First puppy born at 6:20 pm on October 22 with final puppy born at 1 am. I stayed up until 3 to be sure and then had to be up for work by 7! Fortunately, I do work at home. Then…..pre- and post-feeding on November 6th. There are 5 boys and 1 girl. …We are at the adorable messy stage.